Let’s assume you haven’t done any type of stretching, mobility, or foam rolling recently. If you haven’t, you are probably suffering from overly tight muscles, muscles imbalances, and most likely low back and/or shoulder pain. Common remedies most golfers choose are ibuprofen, chiropractor, or avoiding the game. If you go to a doctor, their advice is to STOP doing whatever it is that hurt you for weeks on end. As a golfer, that’s painful advice… and it’s often not the right advice. It may sound common sense to just “stop” doing what causes pain… sure it may go away over time… but chances are, you’ll be right back where you started when you resume normal activity. That’s treating the RESULT and not the CAUSE. The approach I’m going to suggest is more about fixing the ROOT CAUSE and not the RESULT. Years of neglect will guarantee that you have overly tight muscles. And I’d bet you have adhesions in your muscles that inhibit your movement patterns. The tool that I personally use above all others has helped to repair and restore my movement patterns. Using this tool, I have increased my flexibility and joint mobility while decreasing muscle tightness and pain. My newfound flexibility has funneled down to my golf swing, allowing longer drives, more endurance, and a reduction in injury. Today, I feel as flexible as a cat… but I wasn’t always flexible. So what’s the tool I used? After a good foam rolling session, you’ll feel like you drank from the “fountain of youth“. And it’s true… many of my students claim the same thing after a good foam rolling session. When I first tried it out, I was skeptical. Rolling actually hurt pretty bad, and I gave up on it because of that. And I kept feeling the same low back pain because I gave up on trying foam rolling. A few weeks later though, I stumbled across an interview with famed trainer Tony Horton (P90X) discussing foam rolling and yoga. In a nutshell, Tony discussed how foam rolling and yoga were the “fountain of youth”. He went on to say that foam rolling could reverse age related stiffness and restore the body to a more youthful state. Tony went so far as saying that with foam rolling, stretching, and yoga – you could “reduce your real age”. Tony went on to mention that if you hit a pain point during foam rolling, that meant that you needed to foam roll that area! Pain was a signal that I needed to roll – not the reason to quit. A fully pliable and normal muscle will yield little to no pain when foam rolled. And I’d bet money if a baby could foam roll… they wouldn’t have any pain whatsoever. Their muscles are soft and pliable. As we age, muscles become tight, inflamed, and entangled with ligaments and tendons and even form adhesions from injuries. Left untreated, these adhesions restrict movement… and worse, call upon weaker muscles to carry the load of the restricted muscle. Muscle tightness can lead to serious injury and pain. Foam rolling has transformed my game.. and you can transform yours in just minutes every evening. I do my foam rolling right before bed and spend about 15 to 20 minutes on the floor watching the Golf Channel or some sporting event. I focus on trouble spots and spend time to make sure each side of my body is equaled out. Hit the Ball Longer – It’s no secret that a wider and longer golf swing equate to more club-head speed. And you will make your swing more efficient by being able to generate more power with less effort. Reduce Muscle Soreness – researchers from both Canada and Australia found that post-workout rolling reduces muscles soreness and improves range of motion. Reduce Muscle Fatigue – University of Rhode Island study found that those who foam-rolled prior to workouts reported less post-workout fatigue. Increase Range of Motion – Yet another study found that a combination of foam rolling and static stretching can increase range of motion better than either technique alone. Helps Arteries – Researchers in Japan found that just one session of foam rolling can decrease arterial stiffness. This makes it easier for blood to be pumped through the body, which allows you to heal faster and be more efficient with movement. So, that’s a pretty clear case that you should foam roll for golf, right? …and just in case you didn’t know how to get started foam rolling, I’ll be releasing a new foam rolling module by the time you read this inside my members clubhouse. Click here to unlock every decompression, flexibility, joint mobility and stretching program I’ve ever created. 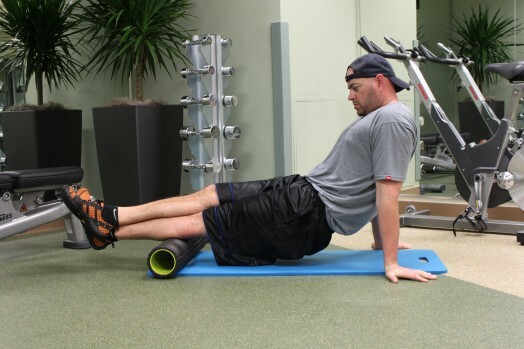 Oh, and there’s even a foam rolling video module as well… that shows you EXACTLY what to do.